Is Philosophy Religion for Atheists? 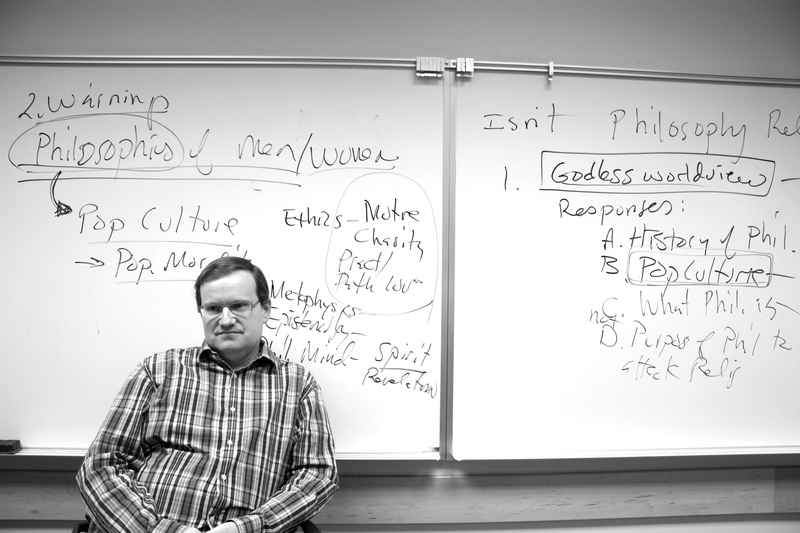 In a lecture regarding philosophy’s interaction with belief and atheism, David Jensen challenged the claim that philosophy is the age-old rival of God. Perplexed by this somewhat typical response to the study of academic philosophy, Jensen asked why philosophy and religion are so often perceived “as if they’re acid and base.” Even more disconcerting to Jensen is the popular cultural association between the study of academic philosophy and individuals who choose to leave the Church. As a professor of philosophy at BYU, Jensen laughed about frequently meeting the reaction “They should not be teaching that stuff at BYU!” when he introduces himself in new wards. “What do we say to these responses?” Jensen asked. To make sense of it, he went back to the meaning and purpose of religion, arguing that religion is often what presents us with a worldview. For many people, “religion tells you the purpose of life, how to live life and what it all means. If you abandon religion, you’ve lost that comprehensive worldview on the meaning of life and the purpose of life,” Jensen said. Jensen asserted that if atheistic individuals are really looking for a godless worldview to show them the ropes, they ought to “go with pop culture – you can find plenty of people there trying to tell you what you should be doing.” In fact, Jensen said there are plenty of places – literature, politics, etc. – in which people are willing to tell you what you should do with life and what life’s about. As a parent, Jensen said that when he thinks of the list of things that he worries about influencing his kids, he ranks academic philosophy pretty low. However, the actual study of philosophy is comprised of studying in fields like logic and the philosophy of language and the philosophy of science. “If you study philosophy of science, you’re studying the assumptions of science and deep concepts of science like the nature of space and time,” Jensen said. You might say, “But that doesn’t have anything to do with replacing God?” and that’s Jensen’s point. When philosophy does interact with religion, often it is trying to better understand concepts like faith and how we understand God. “If you talk about right and wrong, good and bad, morality, and free will, and faith, and hope for things which are not seen which are true and all these things, you are making use of philosophical concepts whether you like it or not,” Jensen said. Regarding the Church’s relationship to philosophy, Jensen asked how we can make sense of the command to not preach the philosophies of men mingled with scripture. So, is the warning really toward academic philosophy? “I think the warning is something more like pop culture, which is a cesspool of horrible ideas,” Jensen said. “I think that’s the real warning. I don’t think it’s Descartes; I don’t think it’s Kant. I don’t even think it’s Hume, and I’m a Kantian.” Kant and Hume are typically considered to oppose one another’s philosophies. That said, how can the study of philosophy benefit the religious believer? In the end, according to Jensen, philosophy is what helps us grapple with questions that every religious thinker must confront: what is faith and what is it to know?